clicking the light bulb on the toolbar. The word “Auto” disappears from the message line and the checkmark beside Automatic Calculation disappears to indicate that automatic mode is now off. 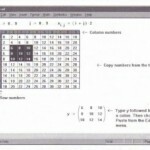 • As soon as you press the equals sign, Mathcad displays a result. 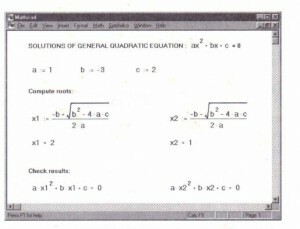 • Mathcad evaluates the expression on the right side of the definition and assigns it to the name on the left. • Mathcad then takes note of all other equations in the worksheet that are in any way affected by the definition you just made. you enter or calculate an equation, when you scroll, during printing, or when you enlarge a window to reveal additional equations. 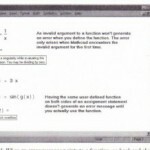 In all these cases, Mathcad evaluates pending calculations from earlier changes. As Mathcad evaluates an expression, it surrounds it with a green rectangle. This makes it easy to follow the progress of a calculation. 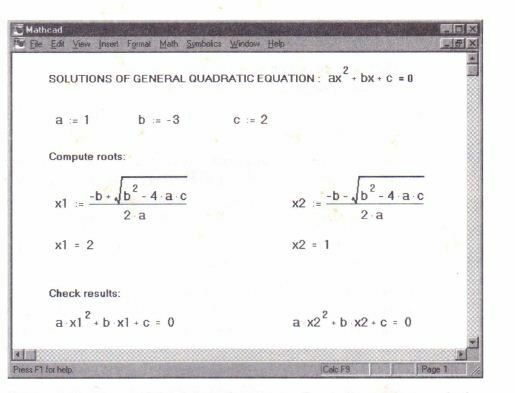 To force Mathcad to recalculate all equations throughout the worksheet, choose Calculate Worksheet from the Math menu. 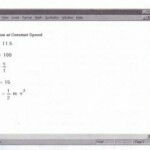 In manual mode, Mathcad does not compute equations or display results until you specifically request it to recalculate. This means that you don’t have to wait for Mathcad . 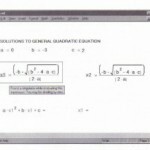 to calculate as you enter equations or scroll around a worksheet. Mathcad keeps track of pending computations while you’re in manual mode. 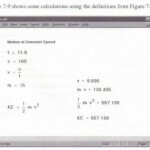 As soon as you make a change that requires computation, the word “Calc” appears on the message line, as shown in Figure 7-11. This is to remind you that the results you see in the window are not up-to-date and that you must recalculate them before you can be sure they are updated. date results. xl Check results: a .xl 2 + b .xl + c = 0 a x22 + b x2 + C = 0 To process the whole worksheet, including those portions not visible in the worksheet window, choose Calculate Worksheet from the Math menu. To switch back to automatic mode, choose Automatic Calculation from the Math menu. Mathcad updates the entire worksheet and displays the word “auto” on the message line. • Press [Ese]. The dialog box shown below will appear.